How does a central air conditioning system work? How long do central air conditioning systems last? How do I know when I need to replace my central air conditioning system? Should I cover my outside condensing unit with a tarp for the winter? A central air conditioning system is the most efficient way to keep a home evenly cool and comfortable. Properly maintaining your central air conditioning system is important to energy conservation and the prevention of costly repairs. A central air conditioning system has two main components: an outdoor condensing unit and an evaporator unit attached to a furnace or air handler. The furnace or air handler's air filter has the important job of removing dust and dirt from the air. A dirty air filter restricts air flow and causes the unit to work harder and waste energy. It may also lead to a failure of the blower motor. Mice, birds, insects and other wildlife are known to make a home inside of the condensing unit. Find a new home for the wildlife and remove any nests or hives. It's extremely important to keep condenser coils free from debris to allow good airflow over the coils which dissipate the heat. From the inside of the condensing unit, use a garden hose with a steady stream to push out leaves, grass clippings, twigs, pollen and other debris that are stuck between the aluminum fins surrounding the coils. With care, you can also use a refrigerator condenser coil brush to gently remove the debris from the coils. Be careful not to bend over the delicate, aluminum fins. Trim or clear shrubs and tree branches so that there is at least two feet of clear space around the unit and at least 8 feet of clearance above the unit. This space will ensure that there is adequate air flow into the sides and out the top of the unit. Additionally, pet urine can be extremely damaging to a condensing unit. Consider installing a small wooden garden fence around the perimeter of the unit, allowing for a two-foot clearance. This will deter pets from marking their territory. Take a cruise around your home and inspect the registers. Make sure there are no rugs obstructing the air flow. Open the registers and check for any fallen objects, especially if you have small children. Children are known to drop small toys, coins, Q-tips and other items into floor registers. If you suspect a mold problem within your ducts, consider hiring a company that specializes in mold abatement. You might also consider checking the ductwork in your attic or basement. The connections and seams should be sealed tightly so that no cold air escapes and the ductwork should all be well insulated. You can buy vent tape for this purpose from home improvement stores. Run the air conditioner through a start and stop cycle to ensure its safe operation and that it powers off properly. Make sure that your thermostat is set to the appropriate temperature for your family's needs. 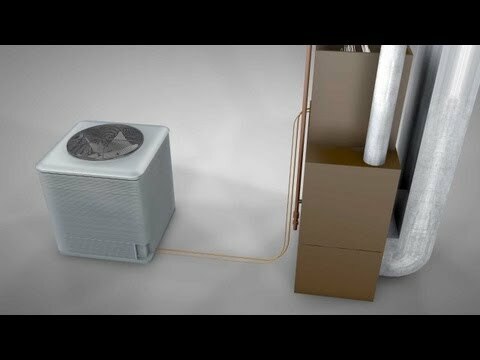 There are many components of a central air conditioning system: In addition to the condensing unit and air handler or furnace, your home's ductwork, insulation, piping, wiring, thermostat, windows and registers all have important roles in the proper functioning of your central air conditioning system. Generally, it's the condensing unit that fails over time. Usually, the problem is simply a worn out fan motor, burned out capacitor, stuck relay or refrigerant leak. Most central air conditioning systems can be expected to last between 15 and 20 years. It's probably time to replace the central air conditioning system when the repair cost exceeds half the cost of replacing the unit. Or, if a new furnace/air handler is required, it may be more cost effective to replace the central air system at the same time. Also, newer systems are much more energy efficient than older systems so it can make sense to replace a unit that is more than 10 years old in order to save money on energy bills. No, you should not use a tarp or other restrictive material to cover your condensing unit. Covering the unit entirely will restrict air flow and trap moisture, leading to problems.